I couldn’t find it on the store’s Web site, and this photo I tracked down online really doesn’t do it justice. Although the top is flowy, it doesn’t have the raggy, hippie look suggested in this shot. Instead, the bust is form-fitting and the sleeves are long and narrow, so there’s enough body consciousness to make it looked pulled together. The long, asymmetrical hemline covers the hips, so when worn over a tank top with skinny jeans, this top makes your legs look as if they go on forever. In addition to the black and light grey pictured here, it’s also available in black and a beautiful purple color called prune. Aqua makes some of the most interesting jewelry on the market today. 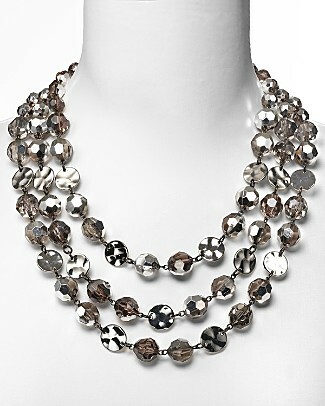 The Three Row Metal Torsade Necklace, available at Bloomingdale’s, is a great basic piece that packs a lot of impact. I love this Komorov dress available at Nordstrom. The fitted bodice and soft A-line make it easy to wear for most body types, and the color is almost universally flattering. Best of all, it’s marked way down from the original price. Anthropologie always seems to come through with the most interesting and stylish tops. 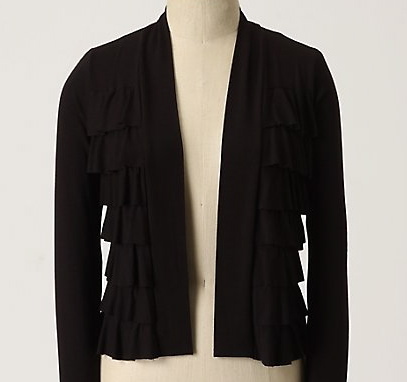 My latest find is the Ruffled Terraces Cardigan–a wonderfully versatile, lightweight jersey top that can be dressed up or down to add great polish to a skirt, pants, or jeans. Because of its cropped length and open front, it looks good over a longer tank or cami. I’m not usually a fan of ruffles, but these lie flat–adding interesting dimension as opposed to flounces and fluff. It tends to run just a bit large, so you might want to try going down a size. Regardless of a woman’s age, jeans are an essential part of her wardrobe. I wear them…I love them…but my biggest complaint is that the fly–particularly a button fly–invariably creates a lumpiness that I could do without. (Note: Sam Saboura’s STYLED jeans mentioned in the post below are not guilty of this, and have the flattest fly panel I’ve ever seen.) Alas, many attempts to camouflage that extra bulk result in a too-baggy top that isn’t even remotely flattering. Until now. Featuring a multitude of snaps down the front, it drapes loosely over the belly yet defines the waist. The result is a body-conscious fit that make all traces of lumps and bumps disappear. 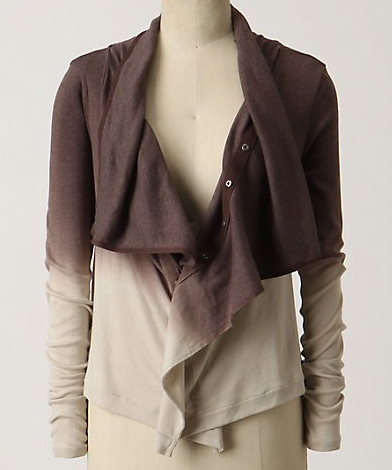 I bought it in a beautiful bluish-grey color that’s perfect with denim, but the Anthro site features only the brown. 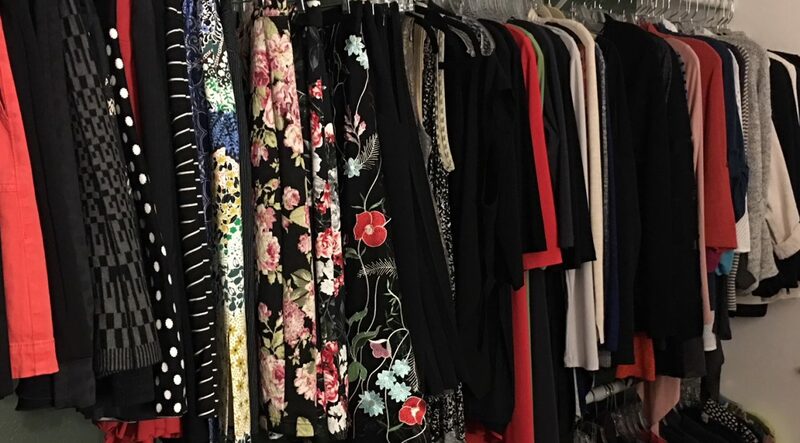 …that Sam Saboura’s latest line of resort wear will be featured on HSN on January 19: 9 a.m. and 3 p.m. PST/noon and 6 p.m. EST. Also, be sure to check out his slim-fit, straight-leg jeans on the HSN Web site. The fit is unbelievable!